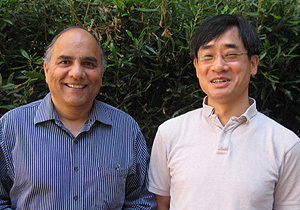 UCSC physicists Sriram Shastry and Gey-Hong Gweon. Although high-temperature superconductors are widely used in technologies such as MRI machines, explaining the unusual properties of these materials remains an unsolved problem for theoretical physicists. Major progress in this important field has now been reported by physicists at the University of California, Santa Cruz, in a pair of papers published back-to-back in the July 29 issue of Physical Review Letters. The first paper, by UCSC physicist Sriram Shastry, presents a new theory of "Extremely Correlated Fermi Liquids." The second paper compares calculations based on this theory to experimental data from studies of high-temperature superconductors using a technique called angle-resolved photoemission spectroscopy (ARPES). The lead author of this second paper is Gey-Hong Gweon, assistant professor of physics at UC Santa Cruz, with coauthors Shastry and Genda Gu of Brookhaven National Laboratory. "I showed my preliminary calculations to Gweon, who is an expert in this field, and he was very excited," said Shastry, a distinguished professor of physics at UCSC. "He obtained data from lots of experimental groups, including his own, and we found a remarkably successful agreement between theory and experiment at a level that has never been achieved before in this field." Shastry's theory provides a new technique to calculate from first principles the mathematical functions related to the behavior of electrons in a high-temperature superconductor. Interactions between electrons, which behave as almost free particles in normal metals, are a key factor in superconductivity, and these electron-electron interactions or correlations are directly encoded in photoemission spectra. Photoemission spectroscopy is based on the photoelectric effect, in which a material emits electrons as a result of energy absorbed from light shining on the surface of the material. ARPES studies, which produce a spectrum or "line shape" providing clues to the fundamental properties of the material, have yielded anomalous results for high-temperature superconductors. "The unusual 'fatness' of the line shapes observed in electron spectroscopy has been at the center of the mystery of high-temperature superconductors," Gweon said. "The anomalously broad and asymmetric line shape has been taken as a key signature of strong electron-electron interaction." Shastry's theory of extremely correlated Fermi liquids is an alternative to the Landau Fermi liquid theory, which is a highly successful model for the weakly interacting electrons in a normal metal but not for very strongly correlated systems. The success of Shastry's calculations indicates that the anomalous photoemission spectra of high-temperature superconductors are driven by extreme correlations of electrons. Shastry coined the term "extreme correlation" to describe systems in which certain "energy expensive" configurations of electrons are prohibited. This arises mathematically from sending one of the variables, known as the Hubbard "U" energy, to infinity. "That leaves you with a problem that is very hard to solve," Shastry said. "I have been studying these problems since 1984, and now I have found a scheme that gives us a road through the impasse. The spectacular correspondence with the experimental data tells us that we are on the right track." The experimental data come from ARPES studies using two different sources of light: high-energy light from synchrotron sources and lower-energy laser sources. In studies of high-temperature superconductors, these two light sources yield significantly different photoemission spectra for the same samples, and researchers have been unable to resolve this inconsistency. But Gweon and Shastry found that these apparently irreconcilable results can be accounted for by the same theoretical functions, with a simple change in one parameter. "We can fit both laser and synchrotron data with absolute precision, which suggests that the two techniques are consistent with each other," Shastry said. "They are telling two different slices of the same physical result." Shastry said he plans to use the new technique to calculate other experimentally observed phenomena. "There is still a lot of work to be done," he said. "We have to look at a variety of other things, and extend the new scheme to do other calculations. But we have made a breach through the impasse, and that's why we are excited." Funding for this work was provided by the U.S. Department of Energy.